I started Speedmonkey in late June 2012. I registered with various manufacturer media sites as well as a couple of general motoring media sites. On 14 August I received an invite from Jaguar Land Rover to attend a media driving day, to take place on 31 August 2012 at the Heritage Motor Centre in Gaydon. I was amazed. The invite had come out of the blue. I wasn't a journalist I was an amateur blogger with a new website that received a few hundreds hits a day, at most. I hadn't driven any cars other than my own and the one I owned at the time was the most powerful I had ever driven - a Mk4 Golf V6 4Motion with 200bhp. I checked a magazine. Most Jaguars had big engines with big power. Hmmmm - nervous and excited all at the same time. What I didn't know back then is that Jaguar Land Rover is one of the more visionary car manufacturers. They understand, more than any other company, what contribution social media and bloggers make to the written motoring canon. In other words car fans and buyers alike are turning away from magazines and turning to websites to provide them with information, advice, and sometimes just something to read for five minutes on the bog. On the day of the 31st the sun was shining as I drove up to the midlands. I arrived and immediately parked in the wrong place. I had parked at the gate house and found a security guard who told me to carry on up the drive and head round the back of the museum. I felt like I didn't belong, that I was some kind of small-time fraud who'd lucked into it and that Jaguar must have made a mistake, which is why I hadn't confidently driven straight up to the front door. I parked up in the main car park and walked into the building to be greeted by a pair of young ladies wearing JLR badges. They asked for my driving licence and then asked which car I wanted to drive. "Erm, um." I nervously picked up a piece of paper. On it was written all the cars available to test that day, which was the entire Jaguar Land Rover range. "XKR-S?" I asked. "Sure," said a girl and handed me the keys. "Bring it back in an hour, enjoy your drive." I walked out of the back of the building and into a curved car park in which was parked more than 30 brand new cars. I was gobsmacked. More than a million pounds worth of shiny new metal for me to enjoy. The XKR-S was a coupé in French Racing Blue. It looked gorgeous. I got in and read the information sheet which was on the passenger seat. It had 550bhp and was rear wheel drive. The interior was clad in leather and Alcantara, the seats were amazingly comfortable and supportive, the overall design was ten times better than in my 2004 Golf. It cost £97,000. Add dumbstruck to gobsmacked. I couldn't work out how to start it. The key had no key. I had never seen that before. I found a button with the word Start written on it. I pressed it. Oh my very good god the noise of the supercharged 5-litre V8 was sublime. I blipped the throttle and the exhaust crackled. Oh, oh, oh, oh WOW! I found the gear selector and put it into drive and pulled away, very slowly. At 20mph I snaked along a mile of road until I reached the main entrance. The road was clear, I indicated left and put my foot down. OH MY GOD! 0-60mph takes 4 seconds in the XKR-S. I had never experienced anything like it in my life. My palms had started to sweat. I found a corner. It turned in faster and with more grip than I knew was possible. For the next few minutes I drove the big Jag as fast as I dared, which was not very fast. My eyes were focussed only on the road and my jaws were clenched. The words ninety seven thousand pounds turned over and over in my mind. Eventually I selected manual and immediately hit the rev limiter. I was flustered, grabbed at a paddle and changed up. Had I broken it? Oh lordy I hoped not. I hadn't, it still worked. By the end of the hour I was more at ease with the car. I still wasn't fully confident in it but I had driven it enough to understand more of its capabilities. I enjoyed my hour immensely. After the XKR-S coupé I drove the XKR-S convertible, XKR and every single car in the Land Rover range. At 4pm I thanked my hosts and went home. It had been an amazing day. I arrived home to find an invite from Mercedes Benz to attend a media day. Instead of being nervous I was looking forward to it. Now, 19 months later, I've driven Porsches, AMG Mercedes', a Radical, a Maserati, more Jaguars and Land Rovers, a Chevy Camaro, a Bentley, Morgans, Lotuses and more - but that first drive on that first media day will stay with me forever. 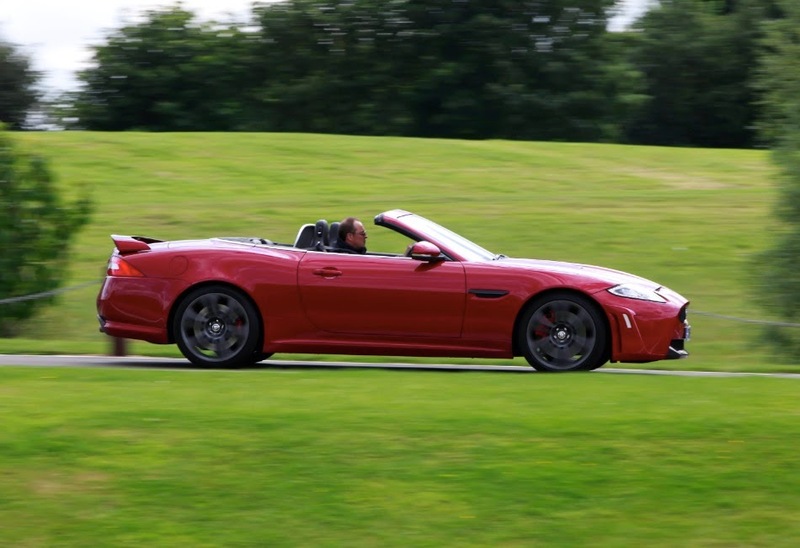 You can see my Jaguar XKR-S coupé and convertible review here. It contains a few syntax and other errors but I read it from time to time and enjoy thinking back to that day. I was hugely unfair to the XKR in the review. I ran one as a press car for a week and loved it. I've also learned that the Jag XK is to be discontinued to make way for F-Types, which is sad. Soon I will be running a Porsche Boxster S press car for a week. I'll attempt to convey what the car feels like to Speedmonkey readers but a little of that original wide-eyed naivety will be lost, which is a shame.